Are you looking for a supervisor who can support you with your whole practice? I see online integrative supervision as not only a professional and ethical requirement but an essential form of self-care. I mostly offer integrative supervision by telephone and online (via secure video conferencing) across the UK and Ireland. I have limited face to face availability for integrative supervision in Colchester, Essex. I will soon be offering integrative supervision in Westport, Co. Mayo, Ireland. 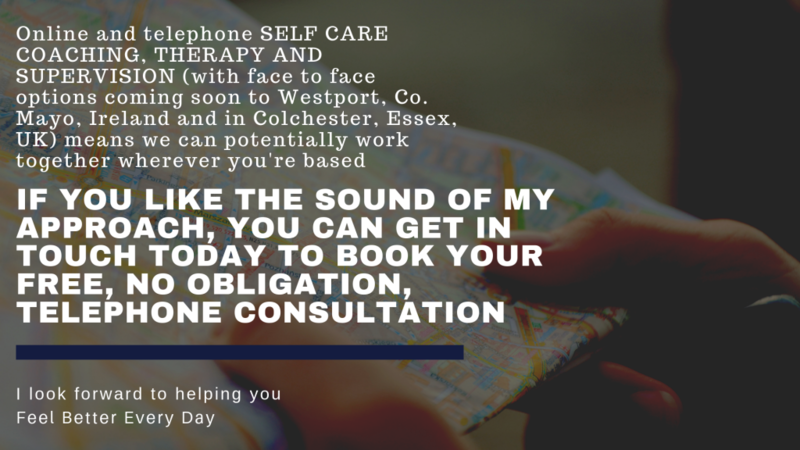 By online, telephone and face to face ‘integrative supervision’, I mean I specialise in working with practitioners who work in different ways and want to ensure they’re working ethically and effectively as well as creatively. For example, supervision for coach-therapists, supervision for integrative counsellors, supervision for psychosynthesis therapists, supervision for coaches and supervision for counsellors who integrate complementary therapies into their work (when appropriate). I also work with supervisors offering supervisor’s supervision (sometimes known as supervision consultancy). I especially love helping integrative practitioners (counsellors, coaches, yoga therapists and other multiskilled practitioners) honour all they have to offer, better support their clients and work more effectively, ethically, creatively and collaboratively. My coaching approach, when appropriate, can also help you with your overall practice. By multiskilled therapist, I mean practitioners who offer more than traditional talk therapy. Maybe you integrate coaching, body work like yoga or energy psychologies like EFT and NLP? While you may still need specialist supervision for areas of your practice I’m not qualified in, I can support you in holding your whole practice. Online supervision or telephone supervision can help you reflect on it as well as on yourself as a practitioner and, of course, your clients. I offer online supervision and telephone integrative supervision (with face to face supervision available in Colchester, Essex and coming soon to Westport, County Mayo, Ireland) to psychosynthesis counsellors, integrative counsellors, therapeutic coaches, life coaches, integrative coach-therapists, Personal Consultants, somatic awareness coaches and therapists, yoga therapists, EFT practitioners, NLP professionals, bodyworkers and energy therapists. A BACP accredited counsellor, I’ve served on BACP’s Coaching Executive since March 2014 and was Chair from January 2017 to November 2018. I continue to serve on the Coaching Executive as Past Chair. An ongoing priority for our members is finding good supervision. I provide supervision in accordance with the BACP ethical framework for good practice in the counselling professions. I am an accredited counsellor with IACP and will be applying for accredited supervisor status as soon as possible. I work within IACP’s Code of Ethics as well as BACP’s ethical framework. Available monthly and ad hoc. Click HERE for prices.